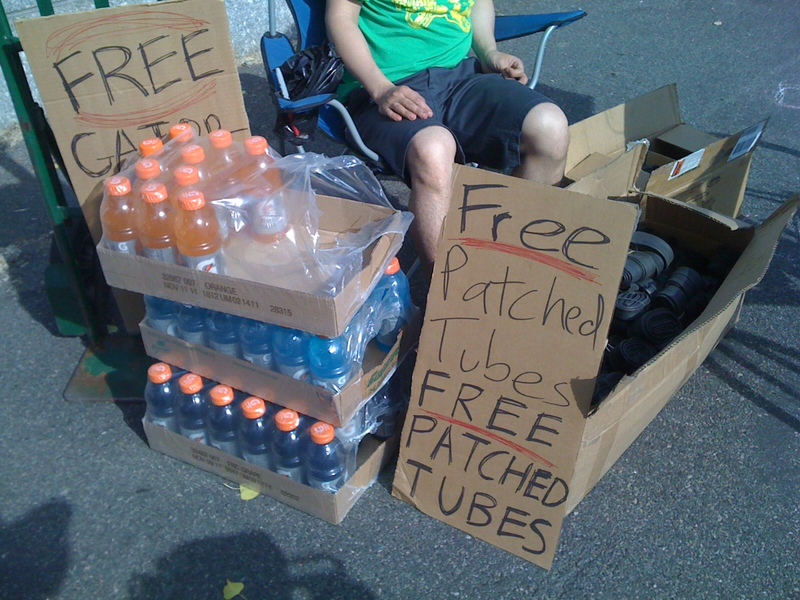 Two very industrious guys from Dah Shop were on the Manhattan Side of the Manhattan Bridge this morning, handing out free Gatorade and free patched tubes to riders. Did you see them on your ride today? I’ve always thought that this would be a great spot for a bike-related kiosk that’s open during the warmer months. Someone could sell the kind of last-minute supplies a rider might need for the final stretch of his or her commute: spare tubes, patch kits, lights, cheap rain gear, snacks, and drinks. Offer some basic bike maintenance and an air pump and you’d have a great amenity for city cyclists. Even something like this would be a great idea. It would fit in nicely with the city’s existing plans to make this area more inviting. Add some cafe chairs and tables and you’d have a great meeting place for people riding to and from work together. DOT fenced off a big section of that area recently… I heard it was gonna be a public plaza. But yeah… adding some bike infrastructure to it is just basic common sense too.